I just got back from vacation this week. Todd, Iggy, and I all went with our family (Todd's mom, his brother and sister-in-law, and their two girls) to Door County for a few days. I had never ever been there before. It's laid-back and beautiful all along the water. We did some fun touristy things (mini golf, go-karts) and some hanging out by the water and/or hotel pool. 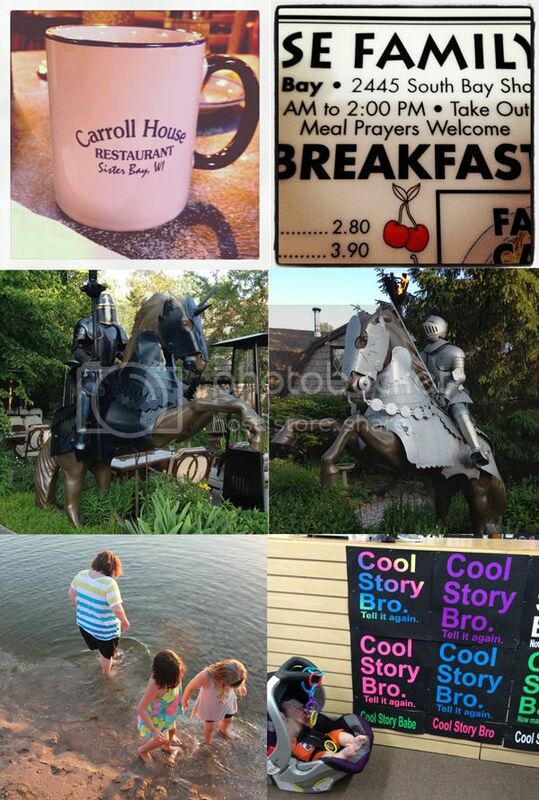 Above, you can see a little collage of "things we did" clockwise from upper left: coffee at breakfast; menu with an odd invite to pray beforehand (that was, um, weird...); knight statue at a restaurant that was too expensive; obligatory tourist t-shirt shop designs; my sister-in-law and her little ones in the water; and the other knight statue from the restaurant (we stopped there but left when we saw the prices). 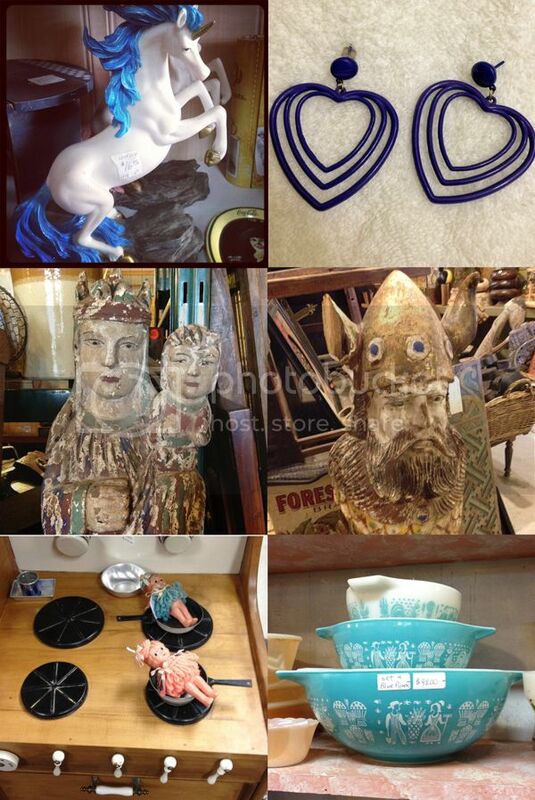 We also spent time browsing in antique shops! See some of my interesting finds below, again clockwise from the left: unicorn statue; 1980's plastic post heart earrings (yep, I bought these for $2); carved wooden viking I wish I had enough $$$ and car space for; turquoise pyrex (my fav of all the colors); baby dolls cooking on a kid's stove (I really found them like that, seriously); and another awesome carved wooden statue, again too expensive to actually purchase. Pretty cool, huh? The weather was much cooler than stupid 90 degree heat here in Chicago. It rained a little, but not enough to ruin our days, and we still got to all of the sights that we wanted to. Lastly, I can't tell you all about Iggy's first vacation without actually showing you a bunch of pictures of him ON said vacation. SO I made a mini collage of him, too. 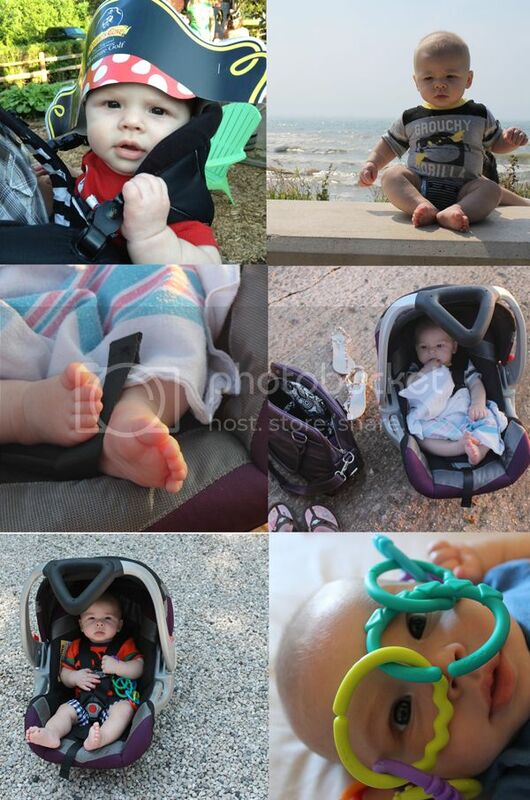 Once again, clockwise from upper left: mini golf at Pirate's Cove; scenic wayside view; chilling in the car seat by the beach; goofing off in the hotel; more carseat fun at a stop in the woods; baby feet at sunset. He seemed to have a good time. I couldn't believe how good he was for having to sit in the car for so long there and back. He still wakes up at least once a night to eat, so I hope that our hotel next door neighbors weren't getting an unexpected wake-up call each night! No one said anything, so I think we did ok. Packing up and traveling with a baby was a LOT of work. Has anyone reading this ever traveled with a baby? How young, and how did you deal? I'm interested in hearing your stories! Hi! Following you from the All Things Pretty hop. Looking forward to reading more! Would appreciate the follow back! Have a great day! Thanks for stopping by! Follow back = done!